Germany takes part in Turkey’s state repression and undertakes the dirty work of imprisoning Turkish and Kurdish dissidents. This is possible because of a paragraph whose roots date back to the German imperial period. Historically, the paragraph had been used to silence and criminalize the republican democrats of 1848, revolutionary social democrats like August Bebel and Karl Liebknecht, communists and anti-fascists in the Weimar Republic and during fascism, but also, members of the piece movement and the Communist Party of Germany during the 1950s and early 60s, and from the 70s onwards, squatters, members of the feminist movement, environmentalists, and anti-globalization activists. Today, it is particularly being used to chase leftist activists from Turkey and Kurdistan in Germany, for their persecution and criminalization. At this, no proof of a so-called concrete criminal act or an illegal action is needed. The single affiliation to a political group that has been classified as criminal or terrorist by secret committees of the German state and the European Union suffices in order to become criminalized. At the same time, it is important to keep in mind that the “terror list” of the EU is subject of political negotiations. The decision of which organization will be put on the list is taken considering strategic questions such as the securing of raw materials like oil and access to and securing of new sales markets. Thus, it might happen that the status of militant organizations evaluated by the EU alternates between terrorist organization and legitimate freedom movement. Legal basis for this is the paragraph 129ff and in particular the in 2002 implemented paragraph 129b that is supposed to deal with “Criminal and terrorist organizations abroad”. The Federal Republic of Germany plays a leading role in the international counter-insurgency. Not seldom are activists being transferred from other EU countries to Germany, in order to be able to sentence them in accordance with paragraph 129b. For us to understand the motivations of the German state, it is important to emphasize that the cross-national persecution of political dissidents from Turkey does not only serve the interest of the Turkish state, but it serves in the first instance the interests of the international cooperation between Turkey, the EU and the US. Because of its strategic geographical location, Turkey remains a key partner for the expansive NATO alliance. Meanwhile, around 20 leftist migrants have been charged by means of the paragraph and are subjects to prison sentences up to six years and nine months. In addition to the arrests and convictions, hundreds of raids on leftist organization premises and private apartments have been executed by the German state. The DHKP-C (Revolutionary People‘s Liberation Party-Front) is a Marxist organization that fights for a society without oppression and exploitation in Turkey. Repression by the German state comprises acts like the organization of events that inform about the political prisoners and of concerts, like concerts of Grup Yorum, a political music band that has been highly criminalized by the Turkish state and accordingly by the German state as well without questioning. Meanwhile, almost all Grup Yorum members are imprisoned or exile. The music band that is a thorn in the flesh of the Turkish state has now been banned in Germany from performing. In the trials, all this political activity is being related to an organization like the DHKP-C. To assign all political activity to an armed context is nothing new in counter-insurgency strategies. In the eighties, any engagement for the isolated prisoners of the Red Army Fraction (RAF) was persecutes as a direct RAF activity in Germany. Many who tried to create publicity about the conditions of the prisoners were imprisoned themselves and had to serve long prison sentences, justified through the paragraph 129a, that is titled “Establishing of terrorist organizations”. 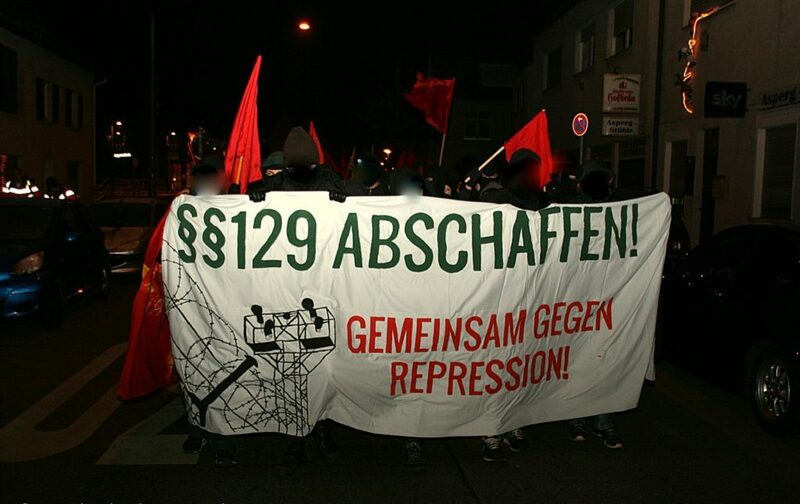 The first 129b trial began in 2008 in Stuttgart. The accusation against five leftist migrants was “membership in the DHKP-C. The five comrades were sentenced to 2 years and 8 months up to 5 years and 4 months. The trial functioned as a pilot project that served the judiciary as a foundation for the further draconian prosecution of other progressive collectives. In another lawsuit in July 2016, four members of the Anatolian Federation were sentenced to many years of imprisonment by the Higher Regional Court in Stuttgart: 4 years and 6 months for Özgür Aslan, 5 years and 6 months for Sonnur Demiray, and 6 years for Yusuf Tas and Muzaffer Dogan. The Austrian State had previously extradited Özgür Aslan and Yusuf Tas to Germany. Between 2009 and 2010, the lawsuit against Nurhan Erdem and two others took place in Düsseldorf. Erdem was sentenced to 6 years and 9 months. Despite the fact that he was deemed unfit for detention, Faruk Ereren was kept in pretrial detention for 7 years. In the first lawsuit, he was charged for “murder” and in September 2011 sentenced to life imprisonment by the Higher Regional Court in Düsseldorf. The second lawsuit against him ended in May 2015 with a so-called “second-class acquittal” because of a lack of evidence. This was not Ereren’s first prison sentence. In Turkey he was arrested during the military coup of 1980 and was kept in prison for 9 years. In 2012, another lawsuit that took place in Düsseldorf sentenced Sadi Özpolat to 6 years in prison. Özpolat was arrested on the 19th of May 2010 in Colmar/France after the German state had requested his arrest. He was extradited from France to Germany in July 2010. Like Ereren, Özpolat had been imprisoned in Turkey as well. There, he was kept under arrest for 17 years in total. He participated in the death fast in 1996 and later became the spokesperson of the hunger strikers. During a 7 years lasting struggle that was directed against the implementation of torture by solitary confinement in which three prisoners were attacked by the Turkish police in their cells and beaten to death, over 120 hunger strikers and their supporters died or were killed by state forces. Back in Germany, in the beginning of 2017, Latife Adigüzel was sentenced to 3 years and 3 months by the Higher Regional Court in Düsseldorf because of her role as the Anatolian Federation’s chairperson. After a ten-months lawsuit, on the 16th of May 2013, Gülaferit Ünsal was sentenced to 6 years and 6 months by the Superior Court of Justice in Berlin. In July 2011, she had been arrested in Greece after an arrest request by the German State and extradited to Germany in September of the same year. But why is the German state so feverishly in search for Turkish and Kurdish dissidents in all over Europe? Why is finding a dissident in Greece and extraditing him or her to Germany so important? 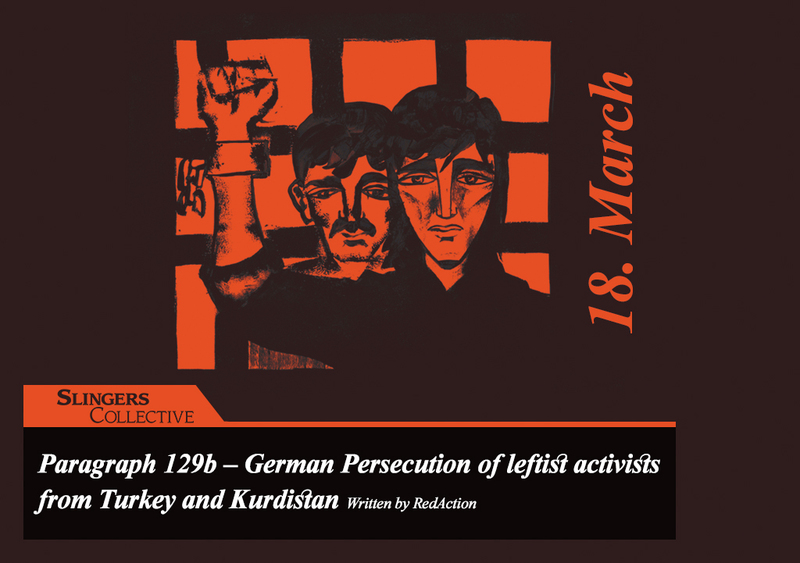 The German Federal Supreme Court decided in October 2010 to apply the paragraph 129b to members of the PKK as well. Since then, 21 Kurdish activists have been affected by related lawsuits and 19 were sentenced to imprisonment, some of which had to endure years of prison and severe physical torture previously in Turkey. In some cases, their lawyers applied for the hearing of prominent witnesses from Turkey/Kurdistan who would be able to testify about the human rights situation and the war against Kurdish people in Turkey. They were turned away and their applications disapproved with the explanation that the conditions would be known, but that the Kurdish liberation movement would have no right of armed resistance. The absurd thing is exactly that the German state has granted itself the right to determine if an armed resistance against a repressive state is justified or not. What institution has granted such a right to the German government, except for the market? Furthermore, ten members of the Communist Party of Turkey/Marxist-Leninist (TKP/ML) are currently on trial. The trial began in June 2016 in Munich and there is no end in sight. Meanwhile six of the ten are no longer in prison, but the trial continues against all 10 of them. As many other 129b prisoners, a part of the TKP/ML prisoners had to endure prison and torture previously in Turkey, some of them for many year. One of the recent 129b cases was the arrest of Musa Asoglu, a DHKP-C member who was put on trial in Hamburg in January 2018. Asoglu is being kept under total isolation. The German government leaves a possible extradition of Asoglu after he has served his prison sentence in Germany to the United States open. The trial came to a judgement just recently: six years and nine months of imprisonment. The US had formerly placed a bounty of 3 Million dollars on Asoglu’s head, since his organization had been accused of having committed a “Feda Action”, or “suicide bombing” as governments would call it, against the US-embassy in Istanbul. The most recent case is the imprisonment of Erdal Gökoglu. He had been arrested in Belgium in November 2017 and immediately extradited to Germany. Gökoglu is accused of being a member of the DHKP-C. The trial against him started in June 2018 in Hamburg. In Turkey, he has been imprisoned from 1995 to 2001. During that time he also participated in hunger strikes which caused him suffering from Wernicke-Korsakoff disease. In Hamburg, he has been denied medical treatments. The trial continues. In the German prisons, the political prisoners are confronted with harassment and bullying. Their mail is being read by the prison authorities and handed over to them only after several weeks. Books and CDs are not being handed over. The prisoners are strictly being isolated from each other. Often, they are being kept isolated for 23 hours a day and only being granted permission to go into the yard for one hour a day. It is clear that this strict isolation aims at their demoralization. Faruk Ereren refers to the extensive isolation program as “white torture to demoralize us”. During the pre-trial period, even stricter conditions apply for 129b prisoners. Some of the accused defend themselves against their detention conditions through hunger strikes. 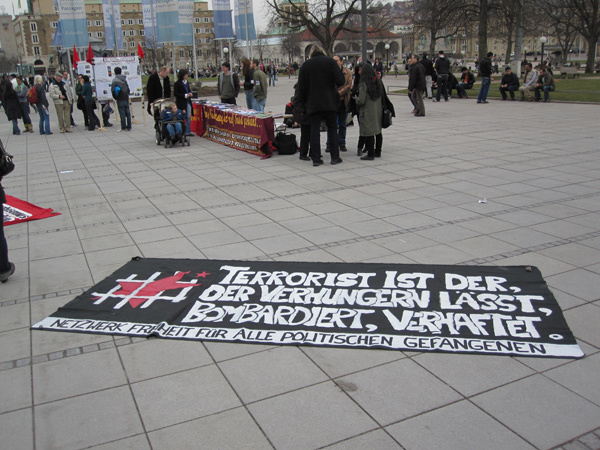 Yusuf Tas and Özgür Aslan hold a 50 days hunger strike before their extradition from Austria to Germany. They are still suffering from the physical consequences. Later, during the serving of his prison sentence in Germany, Tas hold another longer hunger strike, protesting against the fact that he was not allowed to write letters in his mother tongue or speak in his language on the phone. Another prisoner, Sadi Özpolat, has already hold three hunger strikes against the detention conditions and was partly successful. In 2015, Gülaferit Ünsal hold a 54 days hunger strike in which six other 129b prisoners joined her. Through this, she succeeded in ending the bullying and was able to be granted free access to magazines. Last year, Sadi Özpolat and Özkan Güzel hunger struck for 43 and 48 days and finally won recognition for similar demands. Güzel who, based on the paragraph 129b, was sentenced in 2013 to 26 months of imprisonment because he had sold Grup-Yorum concert tickets, hold a successful hunger strike in the Gelsenkirchen prison after which he was permitted to wear his own clothes. When he was imprisoned in Turkey, he participated in the year 2000 death fast and was released due to ill health. Because of forced feeding practices, he suffers from the Wernicke-Korsakoff disease. The indictments against the Anatolian activists often base upon confessions obtained under torture in Turkey. The State Security Senates in Stuttgart and Düsseldorf have no scruples to make use of “fruits from a poisoned tree”, as the Federal Public Prosecutor, Rainer Griesbaum, puts it. The cross-national persecution of opposition activists from Turkey is intertwined with German political and economic interests. Neither the military attacks of the Turkish army against Afrin in Syria, nor the tightened repression after the failed coup attempt with thousands of new political prisoners, closures of publishing houses and newspaper offices, and a permanent state of emergency, have caused the German state to a firm stance against the policy of aggression of the Erdogan regime. In fact, the opposite is the case. The German Ministry of Economics has approved 31 arms exports to Turkey, some of which have been transferred already. One of the approvals comprises special tanks and protection equipment. The argument of the political prisoners’ lawyers that latest after the coup attempt in 2016 there exists no rule of law in Turkey, has been turned away. In the end it is not the legality of the state’s actions in Turkey that determines Germany’s position, but the economic relationship between the two countries and the profit that it brings. Germany has made itself a vicarious agent for Turkey through prosecuting opposition activists that have sought refuge in Germany or other European countries.